God’s Goal – What’s the Whole Point of The Bible Story? God’s Goal – What’s the Point of The Bible Story? God’s goal: What’s the point of all these Bible stories? Are they just entertainment or is there a purpose? God’s goal, what is it? The curtain opens on the next part of our show. The audience hasn’t left, not even for refreshments. They’re still waiting. It’s a live performance, one night only, standing room only. The world premiere of a movie. Dig for Bible Study gems to enhance your understanding : See suggestions at the end of this blog post. Now we examine God’s goal, the reasons for His actions. What His venture is that He is going to accomplish. The ultimate goal that we can summarize in one sentence. The theme of the Bible—the whole story. You might be surprised to learn you already know what it is! Every single human being who has ever walked the face of this earth knows what God’s plan is because it is probably the dearest desire of all human beings—no matter what their race, creed, politics or religion is. Think about what your deepest desire is. As we said, our goal is living together in peace and prosperity… as individuals, families, harmonious nations. God wants what you and all people search and hope for. Crazy simple… too simple you say, so simple that it’s not even the ‘big revelation’ you were hoping for, because it seems so obvious. Well, let me just say that the revelation and mystery is in the ‘plot’ of the story. Onstage, we see a tableau (or freeze frame) of God with the characters of ‘It’s a Small World’. God’s goal, living together in prosperity and peace, is as visible as it is invisible in the Creation account at the outset in Genesis. 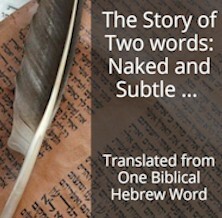 Let’s see it revealed in a context leading up to just one simple verse in Genesis. 1.31 And God saw every thing that he had made, and, behold, it was very good. And the evening and the morning were the sixth day. 2 .1 Thus the heavens and the earth were finished, and all the host of them. Was he in need of a vacation after such a spurt of activity during the previous six days? Why is he resting with the naked Adam and Eve? Is he just too exhausted? Genesis 2:3 is one of the major foundational ‘pieces’ of the puzzle that has been torn to confetti by misinterpretation and miscomprehension and has become unrecognizable. In fact, it is the framework for the whole plan of God. Put this masterpiece in the wrong place, or, better yet, eliminate it altogether, and none of the other pieces of the puzzle fit. Just as this book you’re reading, Origin of the Universe, unfolds in a certain planned way, with each piece following a well-considered design so that the subsequent parts only make sense in the context of what has gone before, so this verse from Genesis has stayed constant throughout the many translations and editions of the Bible. However, the translation, while preserving the placing of the important verse, confounds our understanding. Straight away we’ll realize the important role getting into the Biblical Hebrew is going to play. We are going to dissect this verse to wring out the proper comprehension. What is the real shape of this master piece of our puzzle to which all other pieces are attached? Worldwide understanding by philosophers, scientists, government leaders and yes, even religious figures can be so helter-skelter. Galacti points out that they are sincere. They attempt to explain life and how to live in peace and prosperity, and expound on the question, ‘why is it such a mess?’ They have a noble spark inside them—they want to understand. Galacti suggests a closer study of the ‘master piece’ and the verses that surround it. Why include verses 4-6? particularly verses 5-6 about no rain and ‘mist watering the ground’–it seems disjointed from 1-3. But, it isn’t, it fits in neatly–you just have to understand how. Remember, all the pieces of the puzzle fit together and enhance one another. 2.1 Thus the heavens and the earth were finished, and all the host of them. These verses cover the sixth and seventh days of the seven-day creation week. Notice here that we’re straddling two chapters, which is the way the King James translators separated this text. Galacti is mulling over this creation week story: What is the culmination, the high point, the climax of the creation? Is it the appearance of ‘light’, the first creation endeavor on the 1st day? Perhaps man and woman in the image of God on the 6th day? Or maybe the 7th day itself, after all, often time events lead to a conclusive pinnacle. Would the 7–day creation week story culminate with man and terminate with an anti-climatic event like the 7th day? Yes, you’re going to have to be patient for an answer to this and many other questions. May I suggest you do your own personal study. Go to www.UnlockBibleMeaning.com and find Genesis 2.3. Use the Strong’s concordance to look up the Hebrew words for ‘created’ and ‘made’ and see the difference. We’re now getting into the nitty-gritty of Bible meaning … not just Bible reading. We’re going to learn to dig for Bible meaning. The gems are not on the surface, you have to roll up your sleeves, and get your hands dirty … so to speak. Regarding the ‘mist watering the ground,’ is there some enlightenment to be gleaned from this context? Suggestion: look at Deut: 11.10-11 also about ‘watering’ and where it comes from. Is there a relationship between the mist watering the ground and created / made? Feel free to add your findings to the comments below. I do reserve the privilege of editing comments to maintain the integrity of this website. Since you read all the way to here… you liked it. Please use the Social Network links just below to share this excerpt of Inventory of the Universe, God’s Goal – What’s the Point of The Bible Story? The Garden of Eden, gone, gone, gone forever ... or is it?